(One Owner 2005) Rinker 300 Fiesta Vee. This wide beam cruiser offers you all the space and amenities that you would want or need for a weekend or an overnight on you favorite body of water. The top deck is a very spacious layout for entertaining your friends and family. Plenty of seating and storage for extended cruising or weekending dockside. Powered by the Twin Mercruiser 5.0 MPI's with the Bravo III outdrives. The boat is well equipped with 12,000 BTU Marine Air / Heat, Windlass Anchor with Anchor, Lowrance 3300 GPS, Trim tabs, Compass, VHF radio, in dash Depth finder and Remote spotlight. VHF radio with AM/FM Stereo with 6 disc CD changer, Radar Arch with Bimini Top (New-2017) Camper canvas and Cockpit cover. Snap In/Out carpeting (2016)that is secured to a fully fiberglass lined flooring with textured non skid surface. Cockpit filler seat cushions & Fore-deck Sun pad. The hull has the upgraded two tone colored gel-coat done in blue and white. On the top deck there is a Wet-bar with refrigerator & built in blender.The helm is designed with easy to read and reach gauges and accessories to monitor all your engine functions. 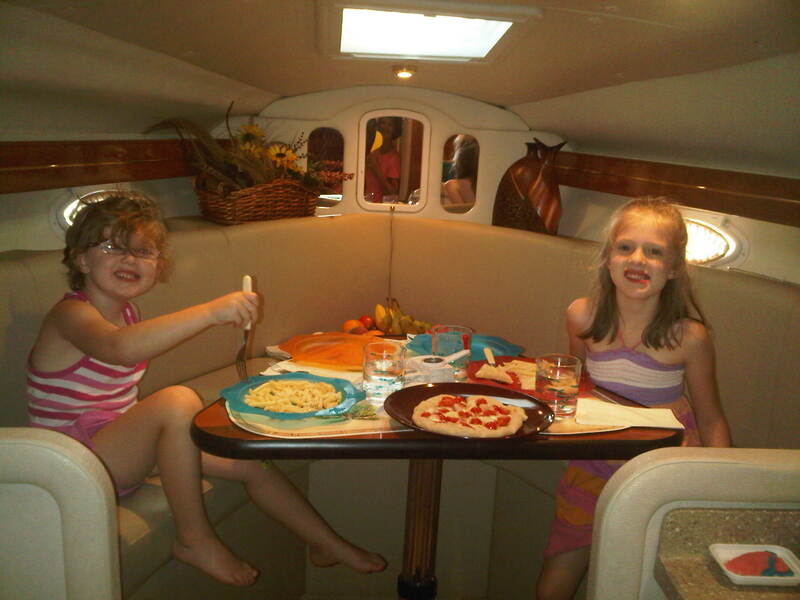 Below deck, there is sleeping quarters for 5-6 people with convertible bed and full galley that includes Cherry Wood Cabinetry-Faux Granite Counters and Ultra-leather Upholstery. Hot and cold water galley sink, Microwave oven, Electric stove, Fridge,Television with built in disc player. Features a fully enclosed head with shower & with pump out toilet that utilizes the boats 47 Gallon holding tank & 33 gallon fresh water tank. At the transom is a deep water built in boarding ladder with fresh hot and cold water rear wash down, This boat is in very nice condition!